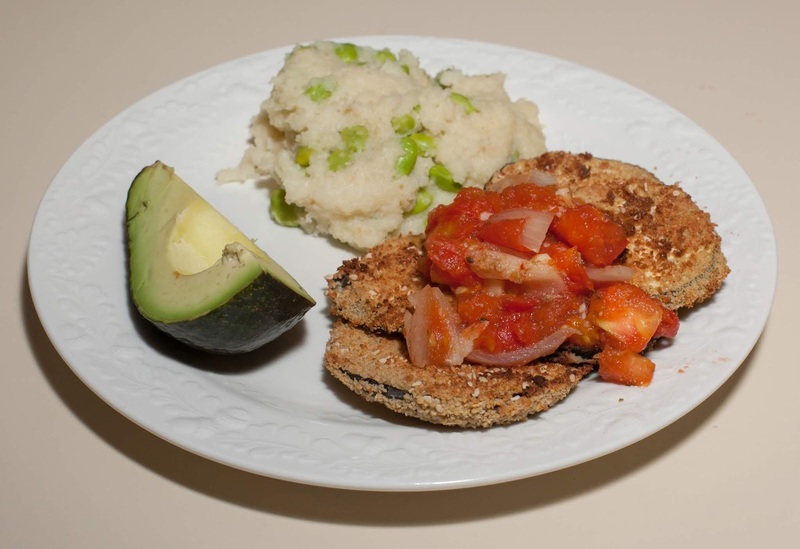 I made an air fried eggplant dish with grits on the side. I used Ener-G Egg Replacer to have a sticky "egg" that I dipped eggplant slices (about 3/8" thick) into, followed by dredging them in a mixture of panko bread crumbs, along with a little nutritional yeast, sesame seeds, salt, and black pepper. I air fried with no oil for 5 minutes at 400°F. I also made a fresh tomato sauce by gently simmering cubes of tomato with onion, dried oregano, a little hot red pepper, and salt, and serving it atop the eggplant. I prepared grits by getting 3 cups salted water boiling then adding maybe 1/2 cup frozen shelled edamame. I cooked for a few minutes till the edamame was defrosted, then added 1 cup grits and a few tablespoonfuls of nutritional yeast. I stirred occasionally and cooked for 5-7 minutes until thick. Dinner was very good! My daughter particularly liked the meal and ate leftovers again later in the evening. The eggplant was nicely crispy and the sesame flavor was quite nice. The grits were very good! I should use egg replacer and sesame more often in making air fried dishes. I was originally going to air fry other vegetables along with the eggplant and should soon make a melange of air fried mixed vegetables maybe served with a tomato or creamy sauce. I was not initially planning on using edamame but it turned out to be convenient. It wasn't an ideal flavor combination, but wasn't bad. I should experiment with other grit combinations.